Quick and easy overnight oats inspired by one of my favourite flavour combos, the mighty carrot cake! This will help keep you energised & feeling fuller for longer. The recipe can easily be scaled up to make a bigger batch, and will keep in the fridge for 3-4 days. Top Tip: Soaking grains, nuts & seeds overnight before eating them helps your body digest them more easily, while also making the nutrients more bioavailable. Add all the ingredients to a jar with a lid, stir to combine. This is my take on the Persian dish called Adas Polo, which literally means lentil rice. Growing up, this was one of my favourite meals so it is the ultimate comfort food for me. I've replaced the rice with quinoa and made a non-dairy yoghurt to go along side it. The combination of savoury and sweet tones are what make Persian food so unique and so reminiscent of home cooked meals enjoyed with my family. Quinoa is a wonderful source of essential amino acids which makes it a complete source of plant protein. It is also high in minerals such as magnesium, zinc and potassium as well as fibre, and a group of antioxidants called flavanoids. Lentils, like quinoa are high in plant protein, and are a great source of iron. They also contain folic acid, and Vitamin B-complex, which are essential for your body. After being brought up eating yoghurt almost everyday, I have now cut it out of my diet completely. So when I made this simple recipe it was a revelation, all the soothing familiar flavours came back to me and it was delightful! You can also add in one diced up cucumber to make a mast-o-khiar, which is the Iranian version of tzatziki. This plant powered, protein packed dish is a definite winner, and I hope you enjoy it as much as I do! Pick over the lentils, making sure there aren't any stones and discarding any shrivelled lentils. Rinse and place in a medium saucepan along with approximately 2 1/2 cups water. Bring to a boil and reduce to a simmer, cover and leave to cook for 20 mins or so, until the lentils are cooked through. Drain any excess liquid and set aside. Heat the oil in a medium pan, add the chopped onion and cook on medium/high heat until they turn translucent, then reduce the heat to medium/low. Add the turmeric along with a pinch of salt and black pepper. Leave to caramelise, stirring occasionally, for approximately 25 mins. Then add the dates and cook for 2-3 minutes, remove from heat and mix in the sultanas/raisins. Rinse the quinoa, at least 3-4 times, this gets rid of the bitter taste. Drain in a sieve then transfer to a large pot along with the 4 cups vegetable stock, a couple pinches of salt and bring to a boil. Reduce heat to low and leave to cook with the lid on for 15 mins. Once all the liquid has evaporated pour the saffron liquid over it, put the lid back on and set aside for 5 mins. Then using a fork gently fluff the quinoa. Make the yoghurt by combining all the ingredients, except for the dried mint, rose petals, and cucumber if using, in a blender and blitz until smooth, adding more water if needed. Transfer to a bowl, taste to adjust seasoning and sprinkle with crushed dried mint and rose petals. Add the lentils to the pot of quinoa and gently combine. When you're ready to eat, transfer to a large plate, cover with caramelised onions, dates and sultanas, then sprinkle a couple pinches of sumac, if using, over the top and serve alongside the yoghurt. I love overnight oats because they're quick and easy to make, are super versatile and you can take them on the go with you when you're pressed for time! Now that the weather is cooling down I like to keep my internal body temperature warm by using ingredients that help keep my internal fire going. This recipe is filled with super boosted medicinal foods which support a healthy immune system to keep the seasonal colds at bay. The use of cayenne pepper in this recipe is to activate the healing benefits of the turmeric while also making you feel all warm and tingly inside. Turmeric is a superfood root which is dried and powdered, the benefits of using it are numerous. For me the most important thing is that it reduces inflammation in the body. Inflammation is your body's response to injury which is great! However, our modern diets and lifestyles of eating highly processed sugars and dairy, drinking alcohol, feeling stressed etc can also cause inflammation in the body. Therefore by adding turmeric to our diets we can aid our bodies by reducing it's workload. It's not a cure all and it also helps to be more mindful of what we fuel our bodies with, both nutritionally and mentally. Cacao is also a very powerful antioxidant, high in magnesium, which helps relax our muscles, hence why women crave chocolate when they are about to start their cycle. Please make sure that you use good quality raw cacao powder for this recipe as nutritionally it makes a big difference. Most cocoa powder you find in your local supermarket has been heated at very high temperatures which kills a lot of the nutrients. It is more expensive but a little goes a long way with so it's worth investing in some as it will last quite some time. If you don't have all the ingredients don't worry, get creative and substitute some or leave others out. Or better yet why not try your hand at making your very own signature version?! Mix everything into a bowl or jar using a fork, making sure it's all well combined. Place in the fridge overnight or for a minimum of 15-20 minutes. Enjoy! *This will last in the fridge for 2-3 days. Now that the weather has started to heat up in Doha, I've switched from warming bowls of porridge to smoothie bowls. I prefer my smoothies in a bowl because it stops me from slurping it all up in one go, which can be quite a shock to the system. My theory is that by eating my smoothie one spoon at a time, I give my body some time to digest it slowly. Plus I like decorating my bowls to make them a feast for the eyes as well as my body. It really doesn't matter what you add to the smoothie so long as you have a good high speed blender, I used my magic bullet and it works just fine! I like to add a mixture of fruits and vegetables and generally try not to add fruits which have a high glycemic index just to keep my blood sugar levels in check. If you do add banana or mango for example, try to add 1/2 teaspoon of cinnamon powder to help stabilise blood sugar spikes. On another note, I'll be hosting a group cooking class at the end of this month focusing on healthful breakfasts, click here for more information. Finally here's the recipe for my super plant powered smoothie bowl filled with anti-inflammatory, antioxidant, blood cleansing, gut friendly ingredients. This is guaranteed to boost your morning with nourishing, healing goodness! 1. Blend the smoothie ingredients, along with the superfood powders if using, in a high speed blender until you have a smooth consistency. 2. Pour into a bowl, and add the toppings. 3. Enjoy the super powerful benefits of this smoothie bowl! The past two weeks have been quite intense for me as I've been recovering from a concussion. I've been feeling rather nauseous followed by migraines, shoulder and neck pain so as a result I've been eating and drinking as much turmeric, ginger and cacao as possible to help heal myself naturally. As I was feeling much better today I was inspired to make us some savoury pancakes for brunch and decided to add in some turmeric, as a precautionary measure for the pain, and I'm pleased to say that they ended up tasting great (husband approved) so thought I'd share them with the world! If you haven't heard of all the incredible healing properties of turmeric here's one example. It's a great anti-inflammatory and has been used in many cultures for hundreds of years due to these specific effects which are caused by the chemical curcumin, that gives it the prominent yellow pigment. Recently studies have shown that it's just as effective as taking synthetic anti-inflammatory medication and when combined with black pepper it's bioavailability is boosted making this wonderful golden spice much more potent and effective in healing the body. 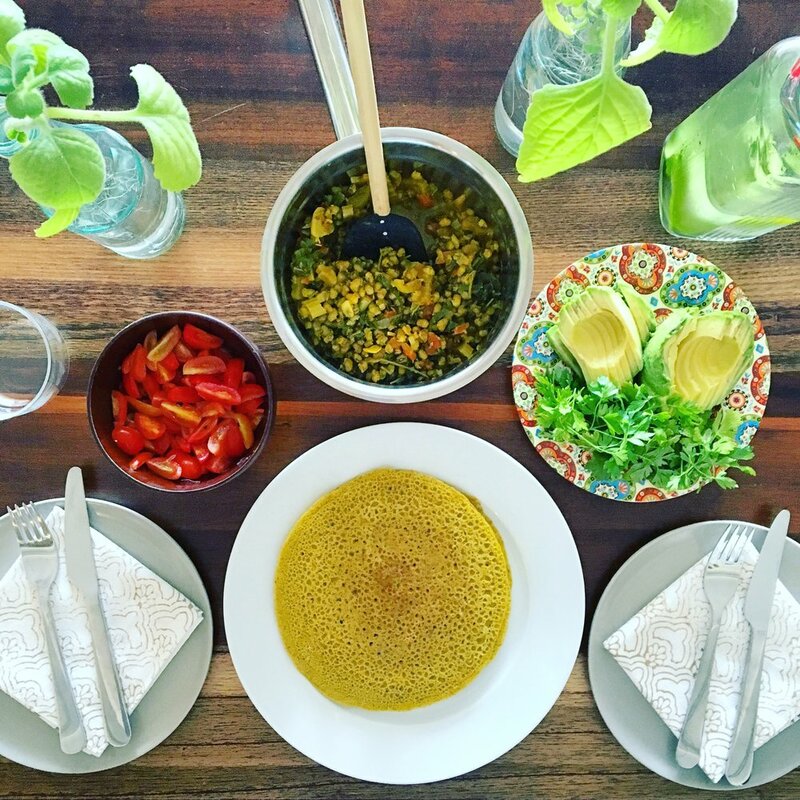 So here's a quick recipe which is 100% plant based, gluten free and wonderfully healing. You can get inventive with the toppings and add whatever you have at home. we had left over mung bean curry from dinner last night so decided to use it again, this can be substituted with cooked lentils, chickpeas or left out completely and enjoyed simply with the avocado and cherry tomatoes. Make the flax eggs by combining the ground flaxseeds with water in a bowl, stir to get an even consistency and place in the fridge to set (about 10-15 mins). Heat up your pan (preferably a non toxic non-stick pan like these) on medium - high heat. Combine all the pancake ingredients in a medium bowl and whisk to combine. Once the pan is nice and hot pour a ladle full of the mixture into the pan, using the back of the ladle to spread the batter out making it nice and even. Leave to cook for 3-4 mins, then flip and cook for another 2 mins. Repeat until you've finished all the batter. Heat up the coked beans or lentils if you're using them. Pour 1/2 the lime juice and a pinch of salt to the thinly sliced avocado . Put the chopped cherry tomatoes in a small bowl along with the rest of the lime juice, sesame oil and a pinch of salt & pepper. Add a little bit of each topping to your pancake and fold it over for a fancy looking crepe or add A LOT of each topping and eat it messily (my preference). This is a deliciously comforting meal to keep you warm in the winter months, my definition of comfort food. It is inspired by my Iranian culture and travels to Sri Lanka & India. It's also 100% whole food plant based made with nothing but pure goodness. I've recently started an online course in plant based nutrition with the Center for Nutrtion Studies founded by Dr. T Colin Campbell and it is such a joy to enhance my knowledge of this lifestyle. It has also influenced my food choices, I'm eating more greens than usual and using a lot less fat. The studies in this field are absolutely incredible and it's so interesting to see how much research has been done in the field of plant based nutrition, especially in relation to chronic diseases. I would suggest reading Whole by Dr. Campbell or watching one of his many talks online if you're curious to know just how much our diet affects our health. Anyhow moving on to the recipe! The rice and tahdig, crispy Persian rice literally meaning bottom of the pot, are made in a rice cooker. I've found that this is the most foolproof, and fuss-free way of making it without burning the rice. However if you don't have a rice cooker you can also use a non stick pot, preferably a non toxic one like the ones Green Pan make. Follow the instructions to cook the rice as stated below, then when it comes to making the tahdig, make sure you cook the rice on low heat so that it doesn't burn. I admit this is quite an art and gets better with experience and much easier if you use a rice cooker! The greens can easily be replaced with whatever is in season in your part of the world. 1. Rinse the rice a couple times, strain and place in a rice cooker, add the 8 cups water, dried coconut and salt and leave to cook, approximately 30 mins. *If you don't have a rice cooker please read the notes above. 2. While the rice cooks, add the tablespoon of coconut oil to a medium sized pot and on medium/high heat until the oil melts. Add the diced onion and let cook for a couple of minutes, then add the garlic, turmeric and curry powder, stir to combine let cook for 1 minute, until fragrant. Then add the diced tomatoes, reduce heat to medium/low and allowing the tomatoes to reduce for about 10 minutes, stirring occasionally. Finally add the kohlrabi/potato, coconut butter, chickpeas, and enough water to cover the ingredients by half an inch or so. Turn up the heat to high and bring to a boil, then reduce to simmer for 15 minutes, uncovered. 3. Once the rice has cooked through, gently scoop the rice from the edges of the pot towards the middle to form a pyramid shape. Make 5-6 holes in the rice pyramid by gently poking the back of a spatula through to the bottom of the pot. Pour a small about of the melted coconut oil into each hole, and leave to cook for another 15-20 mins, this is how you get the crispy rice. 4. Add the chopped spinach and mustard leaves to the curry, cover the pot and let cook for 5 minutes, until wilted. Stir to combine, remove from heat and let sit for 10 minutes or so to allow the flavours to settle. 5. In the meantime place all the "yoghurt" ingredients in a blender (I used my magic bullet), and blend until smooth. 6. Take most of the rice out the pot, except for the bottom layer touching the base of the pot, and using a wooden spatula gently cut and flip over the thin crispy bottom layer. 7. Serve up the dish and enjoy! **This will keep in the fridge for 3-4 days and usually tastes better the next day as the flavours infuse further. With all the cold weather in Doha lately, I've been drinking lots of hot (well, warm) chocolate to keep me snug. This is not the type which is laden with milk and processed sugars, this hot chocolate is 100% plant-based and is guaranteed to give you an excellent boost of nutrients as it's bursting with superfoods. In order to preserve the superpowers of the superfoods, especially the maca, this hot chocolate, is more warm rather than piping hot. The other advantages being that you don't have to wait until it cools to consume it, and you're very unlikely to burn your tongue! The fauxtella is already sweetened with 100% pure date syrup, therefore I don't feel I the need to add more sweetener, however you can add your sweetener of choice to the blender with everything else if you would like it slightly sweeter. This is a delicious and nutritious way to keep the winter bugs at bay and an excellent excuse to have chocolate - need I say more? - Bring one cup water to a boil in a kettle. - Add all ingredients to your blender, including hot water and blend until combined. - Pour the mixture into two separate mugs, sprinkle a bit of cinnamon on top and enjoy! This recipe is inspired by my friend Dan's father, Mooky, who I mentioned in my post about my travels to London over the summer. He grows a lot of his own vegetables and herbs in his garden and makes a salad very similar to this with his homegrown produce. 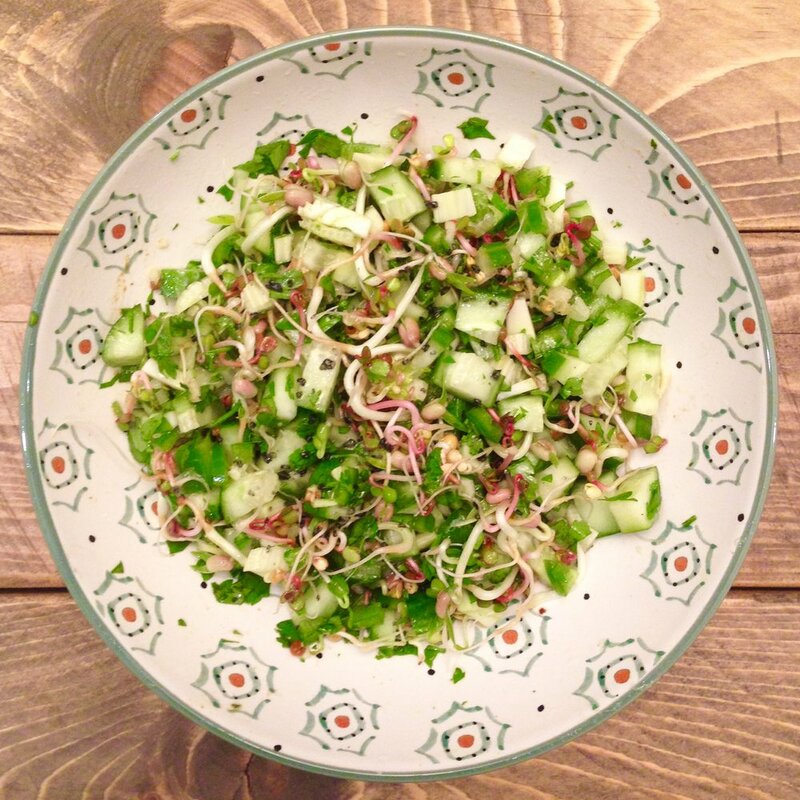 This version is a bit less intense but I do warn you, it is not for the faint hearted as it includes fresh garlic, chilli, and energy and nutrient rich sprouts, so be prepared for a boost of plant power! I recently put some seeds in my germinator and a few days later had way more sprouts that I could handle so I thought of a way to utilise them without too much effort as I was feeling a bit lazy. I had a look in the fridge and saw parsley, fennel, jalapeño chilli peppers, cucumber...I was immediately transported back to Mooky's garden picking fresh herbs and veggies and that's when I knew I had to try and recreate the amazingly powerful green salad he made for us this summer. You can used whatever veggies and herbs you have at home but the key is to keep the flavours fresh and clean. I've been the proud owner of a three tiered germinator for the past 4 years now and go through phases of using it. But when I'm on a roll, I absolutely love it because there's always a quick nutrition rich pick me up at arms length which I can just eat as is or add to salads, soups, noodles etc. Once you have your seeds, I use these, you need to soak them over night in a bit of water. The next day discard the water and put the seeds in your germinator, fill with filtered drinking water, enough to just cover the seeds then tilt upside down so that it drains out, keeping the seeds moist. Repeat the watering and draining process twice a day until you get some sprouts, this should take anywhere between 2-4 days depending on what you are using. Sprouts are a great source of B vitamins, protein and antioxidants which are perfect for vegetarians and vegans alike. They also give your body a lot of energy. Image how much energy it takes for one seed/bean/grain to transform into a sprout, well when you eat it, all that energy gets transferred to your body and is very beneficial to your whole system. However be sure to use organic seeds/grains when sprouting as they will not have any chemicals added to them, and please use clean drinkable water too! 1. Dice the cucumber, fennel, and jalapeño up quite finely and add to a medium bowl. 2. Roughly chop the parsley, and mince the garlic, add to the bowl. 3. Add the sprouts, lime juice, olive oil, cumin, and a pinch of salt & pepper and combine all the ingredients until everything is coated in the salad dressing. Taste and adjust seasoning if needed, and sprinkle some dried chilli flakes on top if you want an extra kick of flavour. I've recently been getting my hands on some really lovely Hass avocados and I couldn't be happier! They are just so creamy and perfect for this recipe. I used to make this quite often back in London, but when I got to Doha I stopped as I couldn't find the right avocados, and trust me I tried, but not all avocados are created equal! So if you decide to make this recipe I would highly recommend using nicely ripe Hass avocados, they are usually more expensive but definitely worth it. This recipe calls for few ingredients therefore using the best quality ingredients really does make a big difference, and the end result is the most rewarding guilt and cruelty free deliciousness! Avocado is packed with heart healthy monounsaturated fatty acids which help reduce inflammation. It is also high in fibre which helps stabilise your blood sugar levels. And it's one of the best source of plant based foods for female fertility as it helps balance hormones - I mean just look at it, it looks like a womb! Raw cacao is high in magnesium, which relieves cramping, probably the main reason why women crave chocolate at that time of the month. It also is great for cardiovascular health as it has shown to reduce the likelihood of strokes & heart attacks. So ladies this one's for you because you'll be doing your body a big favour by eating this. I don't want to exclude the men here either because they will definitely enjoy it, my husband doesn't like avocado and I've fooled him on several occasions with this recipe! Place all ingredients except for the toppings in a blender and whizz until you have a nice smooth consistency, you may have to stop and give it a stir a few times depending on the size of your blender. It works beautifully in the magic bullet as it's got quite a small container. Top with berries, nuts, cinnamon powder, a drizzle of honey and enjoy! *You can also store it in the fridge for 30 mins to set for more of a mousse like consistency, I personally cannot wait that long and tend to devour it straight away! These are the most delicious, filling, easy and protein rich crepes ever! They're naturally gluten free, high in iron, magnesium and Vitamin B-6. These are all magnificent vitamins and minerals which your body needs to function well. Iron produces collagen which keeps your skin looking young & fresh, magnesium helps regulate blood pressure, and Vitamin B-6 aids in regulating your mood and appetite. I first became familiar with them a couple of years ago through Yotam Ottolenghi's book Plenty but was living in the UK at the time and couldn't find chickpea flour very easily, so I quickly forgot about them. It was only recently when I read through my copy of Sarah Britton's cookbook Inspired Plant Based Recipes for Every Season that I immediately put the chickpea flour which had been sitting in my cupboard for a few months, to good use! They are traditionally called Socca, in France or Farinata in Italy, and are made with olive oil, however olive oil has a very low burning point so coconut oil is used as an amazingly delicious and nutritious substitute. The toppings are very versatile, so you can use what you've got in the fridge, which is what I tend to do, and wrap them up into a simple and nourishing meal. They also freeze very well, so you can make up a big batch, freeze, then heat them up in the oven quickly when you need them. Sift the flour over a large bowl, then add salt & pepper, mix to combine. Whisk in warm water and melted coconut oil and let sit for at least 30 mins. This will ensure the crepes hold together well. Then heat up 1/2 tablespoon coconut oil in large pan over medium heat, once hot pour 1/4 of the mixture to coat the pan. Cook for 5-8 minutes on one side, until bubbles start to form and the crepe holds together well (patience is key here) then flip and cook for 2 mins on the other side, and repeat. Add your toppings of choice and enjoy!